This artifact was recovered during excavations at the Union Pacific Railroad Depot in Lawrence, Kansas. 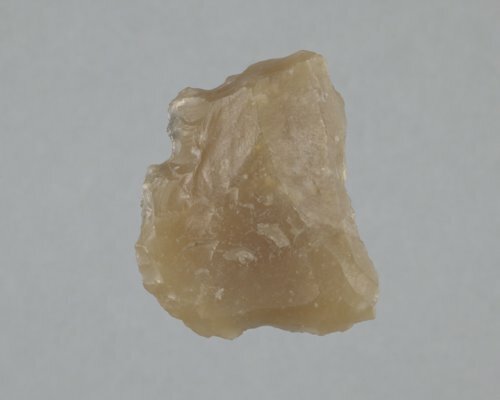 It is either a biface or a gunflint made from either a chalcedony or quarried and manufactured in France, as is indicated by it's honey-yellow or blonde color. The edges show crushing and retouch. Gunflints were used to generate a spark in a flintlock musket or pistol and as strike-a-lights for lighting a fire. This site served not only as a depot, but also had dwellings, a meat market, a saloon, a possible boarding house or hotel, a grain elevator and other commercial buildings located within the project area excavated in 1995 by Kansas Historical Society archeologists.